Join Wharton Club of Chicago, Harvard Business School Club of Chicago, and Harvard Club of Chicago alums for a welcoming Happy Hour at Moody Tongue Brewery before Second Friday Gallery Night in Pilsen. Moody Tongue Brewery was founded by Penn alum Jeremy Cohn and the brewing is under the direction of acclaimed brewmaster Jared Rouben. Moody Tongue, a nickname for a guest with a discerning palate, features “culinary brewing,” combining the worlds of brewing and cooking through the application of a chef's mindset to the brewing process. Rouben previously worked in Michelin-starred kitchens such as Thomas Keller’s Per Se in New York City and Martini House in Napa, CA, before moving to Chicago to pursue a career in brewing. 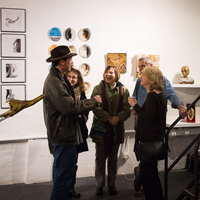 The Chicago Arts District hosts 2nd Fridays Gallery Night, the monthly opening receptions at the galleries and artists' studios centered around South Halsted Street, beginning at 1711 and ending at 2005 South Halsted Street in Chicago. Come visit the creative spaces in the Chicago Arts District at South Halsted Street as they showcase an exciting display of art and artists from Chicago and beyond. This unique art community opens its doors, free of charge, and lets you get up close and personal with the art and artists. Pick up a map at the information center at 1945 S. Halsted Street and explore the city's most vibrant art community, the Chicago Arts District! A Southwest Chicago neighborhood that has blended in the close knit Mexican-American community with creative types and students. Thanks to this diversity, you'll find offbeat vintage shops, independent coffee houses and quaint cafes alongside bodegas, panaderias and restaurants serving authentic Mexican cuisine.